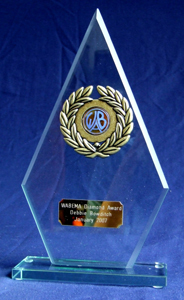 For this Award, a specially engraved trophy is presented. The Award is based on a system requiring 30 points. The table below shows the elements of W.A.B. that must be worked/heard to achieve this Award. 1 The WAB/HAB Squares Award and all its endorsements to Sapphire level must have been attained and claimed. This may be done at the same time as claiming the Diamond level. 2 Book Holders not Book Numbers. 3 DXCC Countries in which you work a W.A.B. Book Holder. Attaining these requirements gives 20 points. Net Control 1 point for each 10 hours as a net controller. 1 for each 20 as back up. Additional Islands 1 point for each 5 UK HF. 1 point for each 2 UK VHF/EU HF. 1 point for each 2 Outside EU/EU VHF. Additional Book Holders 1 point for each 50 HF. 1 point for each 25 UK VHF/EU HF. 1 point for each 10 Outside EU/EU VHF. Activation of Grid Squares 1 point for each 100 activated. CW Activity 1 point for each 100 squares worked/heard on CW. Certificates 1 point for each WAB Contest Certificate awarded after 1st January 2009. 1 point for each Certificate of Merit awarded after 1st January 2009. 1 point for each Decade Certificate awarded after 1st January 2009. Other Modes 1 point for each 25 Squares worked/heard on ATV, SSTV or Data Modes. Navigational Aids 1 point for each 25 worked/heard UK HF. 1 point for each 10 worked/heard UK VHF/EU HF. 1 point for each 10 worked/heard Outside EU/EU VHF.